The Northeast Zone is all waters draining into the Columbia River east of the Deschutes River and all waters draining into the Snake River system up to Hells Canyon Dam. 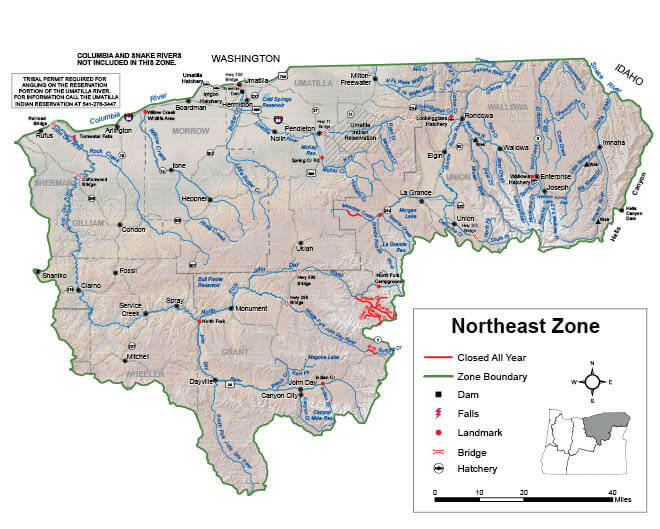 This zone does not include any portion of the mainstem Columbia and Snake rivers. Regulations for the Columbia River can be found in the Columbia River Zone Regulations & Map, and regulations for the Snake River can be found in the Snake River Zone Regulations & Map. Only 1 trout over 20 inches in length may be taken per day in lakes. Kokanee included in trout limits except as noted under Exceptions. No limit on size or number of brook or brown trout. Closed to angling for bull trout. See exceptions for catch-and-release angling under Exceptions for Imnaha and Wenaha rivers. See Umatilla River under Exceptions. There is no annual limit on hatchery salmon as long as the appropriate number of Hatchery Harvest Tags have been purchased to record the catch. Only hatchery steelhead may be taken. Wild steelhead must be released unharmed. There is no annual limit on hatchery steelhead so long as the appropriate number of Hatchery Harvest Tags have been purchased to record the catch. Streams: Open during trout, salmon or steelhead seasons only, except portions of Columbia River tributaries flooded by John Day and McNary dams are open all year. Largemouth and Smallmouth Bass 5 per day, 3 daily limits in possession. No more than 3 over 15 inches in length. Bluegill, Catfish, Crappie, Other Sunfish, Walleye,Yellow Perch, Sucker, Carp, Chub, Northern Pikeminnow, Sculpin, Whitefish, Shad, and other Nongame Fish No limit. None. Margined Sculpin (Umatilla and Walla Walla river systems) It is unlawful to angle for or possess all or any part of these fish because they are listed on the state’s sensitive species list for conservation purposes. Closed.